The capital city of Argentina and one of Latin America's mega-metropolises (with some 12 million inhabitants) and main cultural hubs. It's been nicknamed the Paris of South America, primarily for its grand architecture and cultural life, though today it is more faded and grittier than its French counterpart. There is also quite a lot to see for the dark tourist. In addition, there are several further sites associated with the dark chapter in Argentine history under the military dictatorship, in particular some of the various clandestine detention and torture centres of the period, often located in car repair garages (providing camouflage), such as the infamous Garage Olimpo (as in the feature film of the same name, also released in the many parts of the world under the alternate title "Junta" – recommended viewing!). Several of these sites have been turned into memorial spaces under the aegis of the organization Espacio Memoria. If your Spanish is up to it you can explore (some of) these independently – see www.institutomemoria.org.ar for more detailed information. Look in particular under the key word ex-CCDTyE (for Centro Clandestino de Detencion, Tortura y Exterminio). If your Spanish lets you down too much for such independent explorations (like mine does me) then it is much more convenient – and in general much more rewarding in any case – to go on a guided tour instead. Mine was organized through a company in Santiago de Chile, operated on the ground by a company called CulTour, but tailored and especially extended to include ESMA and Parque de la Memoria Buenos Aires (and thus cost significantly more than the normal tours they offer, but it was worth it!). Regular tours are usually confined to the sites in and around the centre of Buenos Aires, in particular in the district of San Telmo, and include Garage Azopardo, Automotores Orletti, Virrey Cevallos and Club Atletico. 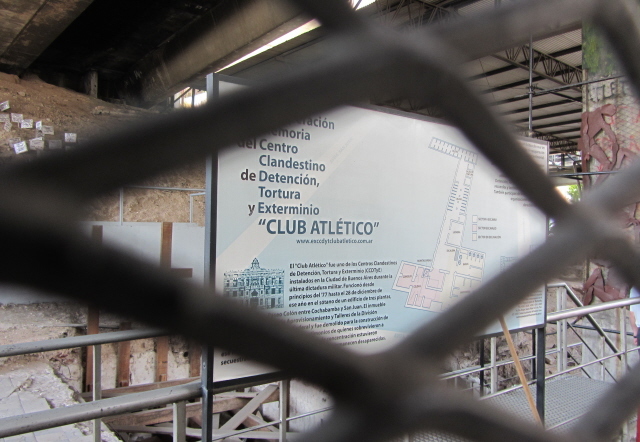 To pick out just two: the latter, named after the Club Atletico sports club it was located in, is currently more of an archaeological dig site, but is projected to become a proper memorial in due course. Its location is rather weird: right under a city motorway overpass. This was specifically built over the demolished building the torture centre used to be housed in as part of a cover-up. But its foundations are now being excavated and investigated. Remains of victims killed here have been found together with traces of torture equipment, and foundations of the former torture cells and other elements of the site are being uncovered. Across the road a small memorial park has already been constructed. It is, however, a very odd and excessively noisy location, quite different from the usual sombre silence of typical memorial sites. Virrey Cevallos is apparently one of the more commodified of the ex-CCDTyE sites, where the grim interior of the former torture centre can be seen – but unfortunately, the site was closed for renovation at the time of my visit (January 2012) so I can't report any first-hand impressions. Much is in flux with regard to most of these sites anyway (see esp. ESMA), and it remains to be seen what will be put into place permanently for visitors/dark tourists to see in the future. I'm thinking of going back for a return visit in a few years' time to check this out. One major site, on the other hand, can be freely visited at any time: the city's central focal point of the Plaza de Mayo – famous for the Madres de Plaza de Mayo, aka the "Mothers of the Disappeared", who still march here in protest every Thursday. It had been these protesting mothers, with their white headscarves and carrying photos of their relatives (husbands, sons and daughters mostly) demanding that the government reveal the fate of these "disappeared" victims of the military dictatorship, that brought the issue to the attention of the general public around the world. On both of my visits (January 2012 and December 2013) the main eye-catcher on Plaza de Mayo, however, was a protesters' camp with huge banners demanding justice and support for veterans of the 1982 war over the Falkland Islands (known here as 'Islas Malvinas', of course). Argentina's official memorial to this war, on the other hand, is located further north on Plaza San Martin, near the Retiro train station – ironically just across from the clock tower still known as Torre de los Ingleses ('English Tower'), even though it was petulantly and crudely renamed Torre Monumental in 1982 after the Falklands war was lost (it is still the target of anti-British graffiti and protests). Unrelated to either this conflict or the "dirty war" is a prison museum in the popular district of San Telmo, which I managed to visit on my last visit too, so I can now give it a separate entry: Museo Penitenciario Argentino. A site of a more romantic, gothic kind of dark is the famous Recoleta cemetery in the district of the same name, which is not only notable for its tomb architecture but also as the final resting place of Evita Peron. Buenos Aires has the largest Jewish community anywhere in Latin America – so it doesn't come as a huge surprise to find a Holocaust Museum here too (even though the city is geographically so far away from where it took place – cf. Cape Town). The Museo del Holocausto, or Buenos Aires Shoah Museum, to give it its official name(s) is located at Montevideo 919 just south of Av. Santa Fe, nominal opening times: Monday to Thursday 11 a.m. to 7 p.m., Friday to 4 p.m. – but when I was there in December/January I found it closed altogether, so unfortunately I can't report anything about the museum's contents here either. The height of summer is generally not a good time to visit such places in Buenos Aires, as many close for the holidays, or undergo refurbishment (as most inhabitants of Buenos Aires flee the stiflingly hot city during this time). exhibits include straightjackets and electric shock equipment! as well as documents and photos relating to the iconic revolutionary's life. Location: on the southern shores of the estuary of the Rio de la Plata (River Plate), the northern-most part of the Atlantic coast of Argentina, just opposite of the south of Uruguay. Access and costs: quite easy by plane, though far away for most; varying price levels. Details: Most foreign visitors to Argentina's capital city will have to fly in from afar, except those coming by cruise ship (also from afar, usually), or visitors from Uruguay just across the Bay (there are frequent boat connections to Colonia and Montevideo). Most flights get into the larger Ezeiza International Airport south-west of the city, fewer land at the city airport Jorge Newbery on the banks of the Rio de la Plata. Getting around the heart of the city centre is best on foot, for longer journeys there's a metro as well as buses. Some longer journeys will still require a taxi (e.g. to ESMA). Prices for accommodation vary greatly, from cheap hostels to top-range hotels; a particularly attractive option in Buenos Aires is that of short-term apartment rentals (from even a single night), which often is cheaper and gives you more space than hotels, though less service, naturally (although some upmarket ones offer some services and even have swimming pools). Food and drink can be more affordable than in other capital cities, but the range of options is somewhat limited if you don't indulge in the Argentinians' omnipresent main food: meat. (In fact when my driver from the airport inquired "Do you like meat? ", answer: no, I'm vegetarian. "Do you like Tango? ", answer: no, not particularly, he said "why are you here?" – at least we agreed on liking Argentinean red wines …). That said, though, I did happen upon a proper vegetarian café/restaurant in San Telmo (see under Museo Penitenciario) ... and otherwise pizza is always an emergency option and one that pretty ubiquitous in BsAs. Time required: A few days minimum to see the places mentioned above – but to really explore the city in some more depth you'd need two or three weeks. Combinations with other dark destinations: see Argentina; and also Chile – Santiago is only a two-hour flight away! The Falkland Islands (Malvinas), by the way, cannot be reached from Argentina at all – all air and ship links remain severed to this day – but weekly flights from Santiago (via Punta Arenas) provide the standard connection (as long as Argentina allows it, at least). Combinations with non-dark destinations: Buenos Aires is a major mainstream city holiday destination – for many good reasons. It's full to bursting point with cultural offerings (way too many to even begin listing them here), and some of its city architecture is amongst the finest on the entire continent. Obviously, many mainstream tourists hanker after the legendary Tango tradition that Buenos Aires is world famous for, and they are well catered for (too much so for my taste). At least one of those evening "tango shows" is considered a must by many people. The prime mainstream tourist stomping grounds are around the central Plaza de Mayo, esp. north along the pedestrianized (and heavily commercialized) Florida street. The city's main artery, however, is Avenida 9 de Julio, the world's widest city boulevard (mostly 14 lanes of traffic), with the central landmark Obelisk at Plaza de la Republica. The old harbour docks area east of the centre has seen the type of "revitalization" familiar from British port cities such as Liverpool or the London Docklands – in fact many original Victorian warehouses of a distinctly English style survive, now converted into expensive apartments and offices to complement the amassed new concrete-and-glass edifices opposite. Those looking for a taste of the more original Buenos Aires head for San Telmo and Boca, south of Plaza de Mayo and Montserrat, which have become colourful Bohemian quarters.